Switzerland is a country poor in raw materials and yet, every year, 70 per cent of the gold extracted in the world is refined there. Switzerland is home to four of the largest refineries in the world. But where does all this gold that is processed and marketed in this country come from? The Society for Threatened Peoples (Société pour les Peuples Menacés – SPM) in Switzerland explored the global gold trade with a close look at the cases of Peru, the United Arab Emirates, Sudan, Liberia and the Democratic Republic of Congo. 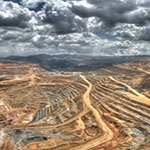 The report “Switzerland, gold platform at risk?” shows that there are significant risks that some Swiss gold processing and trading sites are indirectly complicit in human rights abuses and environmental destruction. Read the summary and access the publication in French and German here.